The HP Pavilion 13 Notebook is a nice, but small laptop, perfect for school and work. However, it does have a few drawbacks. If something goes wrong with the hard drive, and you suddenly need to run the recovery, it can be rather difficult to fix the problem. 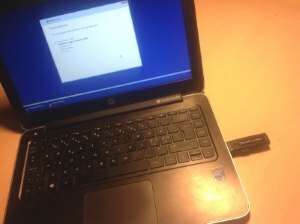 Replacing a malfunctioning hard drive can be very difficult with this laptop. One reason for this is that the case has, a lot of hidden screws, and on top of that, it is also hard to get open after removing all of the screws. To open the case, after removing the screws, you will need to use a flat object. A plastic card, such as a expired not-needed membership card, is likely the best option. The card might be damaged, so do not use your credit card! Note. 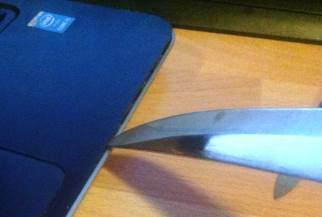 It is, not recommended that you use a sharp knife, since you can easily end up cutting yourself. You can also watch the video last in this article, to see how the flat object may be used to open the case. Removal of the screws is not shown, but that is also the easiest part. Just remember to remove the rubber pads below the case. 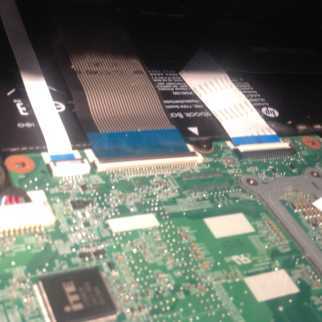 For some reason HP decided it was a good idea to hide the screws (it really is not, and you just risk users damaging their laptop). The Pavilion 13 case design got multiple problems, which makes it hard to deal with for users. 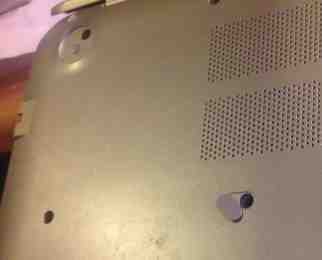 We can easily end up accidentally scratching the case, or even breaking it, because we do not realize that the manufacture is daft enough to hide the screws behind the rubber pads on the back. Another problem is that the rubber “nubs” hiding the screws cannot be easily re-attached. Users have to get some special glue, which will not bind or stick too much to the case, but also bind enough to not fall off. I simply did not put my pads back on, and now I think I may even have lost them. The case design is, basically, a huge problem, and it is surprising that laptop manufactures make it so difficult to get into the cases. It is, not necessary to make it so hard to open. Opening a case should be intuitive and straight forward for users. I often upgrade my hardware, and next to all the bloatware manufactures install, this is, one of the most annoying things. On the manufactures part, it is probably a bad practice to store the recovery software on a hidden partition. It would be much better to include it on an external media, like in the old days, such as DVD or USB. I prefer USB, since I do not use DVD or BlueRay myself, and actually prefer my laptop to come without such drives. The problem is that users will not be able to re-install on a new hard drive without either getting in touch with HP or the place where they brought the PC. It also makes Dual Boot setups more difficult, as users risk deleting or making the recovery partition become inaccessible. Personally, I have both Linux and Windows installed in a dual boot setup, since I need to use Windows in my school. The official HP website is very hard to navigate, and does not hold the information people are looking for. In my case, I want to know what the maximum supported memory is, before I buy new RAM. In the end I simply decided to buy another 4gb DDR3L stick, since that was the limit listed by at least one shop which was still selling the computer. Later I was reading on Crucial's website that the limit was 16gb, so now I am simply not sure. I am leaning towards thinking Crucial got the numbers right, since they actually sell memory modules. So, @HP please update your site and product specifications! Such information should be available without having to download the entire Manual! I actually even went and downloaded the Manual as .pdf, and I was unable to find the information by searching for strings such as "memory" or "ram". I am not going to read the entire manual just to find a small detail like this! The laptop uses DDR3L memory, which is smaller than normal DDR3 sticks. When you ask for the modules, specifically ask for DDR3L, (or pick it when searching / ordering from webshops). I just want to also briefly complain about the touchpad. The laptop is using synaptics touchpad, and this has caused massive problems in Windows 10. For a very long time, Microsoft would keep installing broken drivers for the touchpad, and I had to manually revert back. The tool to disable specific updates (temporarily) did not work for long. Luckily it seems like they have finally fixed it. After more than 1-2 years of brokenness! I know they are likely not responsible for Microsoft's gigantic imbecilic mistake (pushing broken drivers to my laptop), but I can not be sure. And then there is the whole problem with the case design. The FAN has also been stuck, and I had to take it out, and remove dust from it, breaking some tiny unimportant plastic in the process. Finally, I am also having symptoms of a key "5" not reacting sometimes when it is pushed, also to my great annoyance. Just to mention something positive. One of the good things about this computer is its size. After upgrading the RAM, and switching to an SSD, the FAN is only active when doing heavier work, so I can highly recommend doing both – before you spend a fortune on a new laptop. After getting an SSD, the laptop remain almost totally quiet. It also works very well with Linux once you work out the initial problems with UEFI boot mode.